Teaching the Codex is run by Tristan Franklinos and Mary Boyle. Tristan came to palaeography through Classics, and Mary through medieval English. They began to compare approaches during their Masters degrees at Merton College, Oxford, and discussions with fellow postgraduates made clear the variety of teaching methodologies out there. These discussions led, ultimately, to Teaching the Codex. The Teaching the Codex committee members are Alex Peplow and Jessica Rahardjo. Mary is currently an Irish Research Council Postdoctoral Research Fellow at Maynooth University. Before this, she was a Visiting Scholar at the Centre for British Studies/ Großbritannien-Zentrum at the Humboldt University in Berlin, and a lecturer in German at Oriel College, Oxford. She completed an AHRC-funded doctorate at Merton College, Oxford in 2016, researching late medieval accounts of pilgrimage from England and Germany to Jerusalem. She is interested in the comparative literary study of Germany and England throughout the Middle Ages, and into the early modern period, and particularly in religious writing. Mary has also worked on English vernacular manuscripts and German and English early printed books. Her current research interests are in nineteenth-century cross-cultural (Anglo-German) medievalism. You can read her blog here, or follow her on Twitter. Click here for her faculty page. * (forthcoming) ‘To Gaze or Not to Gaze: The Nineteenth-century Der arme Heinrich from Volksbuch to Dante Gabriel Rossetti’s “Miracle Rhyme”’ (Modern Language Review). * (forthcoming) ‘Imaginatio, Anachronismus und Heilsgeschichte’ (with Annette Volfing), (proceedings of the 2017 Anglo-German Colloquium). * (2018) review of Rüsenberg (2016) Liebe und Leid, Kampf und Grimm: Gefühlswelten in der deutschen Literatur des Mittelalters (Modern Language Review). * (2017) ‘Merton College, MS. 315: An Introduction’ (Oxford German Studies). * (2016) Verse translations of thirteen poems for sleeve notes of Der Wanderer: Schubert Lieder (Delphian Records). * (2015) ‘Converting Corpses: The Religious Other in the Munich Oswald and St Erkenwald’ (Oxford German Studies). 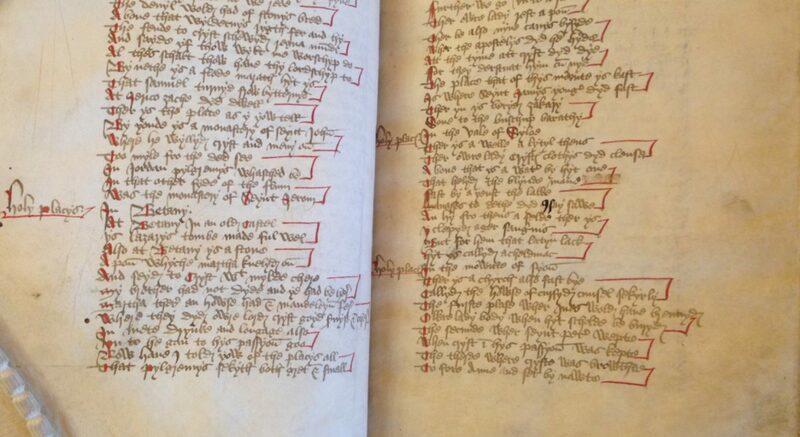 * (2015) ‘William Wey’s Itinerary to the Holy Land: Bodleian Library, MS Bodley 565 (c. 1470)’ (Bodleian Library Record). Conclusions included in the Bodleian Library’s online catalogue entry for MS. Bodl. 565. * (2013) Two translations in The Impact of Idealism: The Legacy of Post-Kantian German Thought: Volume 3. Aesthetics and Literature, ed. Christoph Jamme and Ian Cooper (Cambridge: CUP). Tristan is a British Academy Postdoctoral Fellow in Classics and Junior Research Fellow at Trinity College, Oxford; he also lectures at Oriel College, Oxford. He is currently working on a new critical edition of, and literary commentary on, [Vergil]’s Catalepton. In his doctoral thesis, he explores the ways in which the Latin elegist Propertius engages with and recasts his own poetic material, as well as that of his peers and predecessors. More broadly, he is interested in the literature of the first century B.C. (esp. the poets and Vitruvius); the place of the author and the reader in relation to a text; and in textual criticism, palaeography, and the history of the book. You can follow him on Twitter here. Click here for his faculty page. * (forthcoming) T. E. Franklinos and H. Hope (edd. ), Revisiting the Codex Buranus : Contents, Contexts, Composition (Boydell & Brewer, Woodbridge). * (forthcoming), ‘Classical Learning and Audience in the carmina amatoria: a Case-Study on Codex Buranus 92′, in Franklinos & Hope (edd.). * (forthcoming), ‘The Cause of Idmon’s Death at Seneca, Medea 652–3, and at Valerius Flaccus 5.2–3′. * (forthcoming), ‘Textual Notes on Catalepton 10′, Classical Quarterly. * (2018), ‘summa harena: the sand’s surface and Ovid, metamorphoses 2.573′, Hermes 146: 512–16. * (2018), ‘Ovid, ex Ponto 4: an intratextually cohesive book’, in S. Harrison, S. Frangoulidis & T. Papanghelis (edd. ), Intratextuality and Latin Literature (Berlin/Boston), 289–306. * (2017), ‘A Plautine Emendation: “miles gloriosus” 1268’, Hermes 145: 109–12. * (2015) ‘Textual Notes on Palladius’ opus agriculturae’, Mnemosyne 60: 1020–30. Alex is a DPhil student in the History Faculty, University of Oxford. He is working on a thesis entitled ‘Political Ecclesiology: Ockham, Ludwig IV, and Anti-Papal Imperialism’. He is also interested in the spread of non-German literature within the Empire. You can follow him on Twitter here. Jessica is a DPhil student in the History Faculty, University of Oxford. Her current research is on early Islamic funerary material culture in Southeast Asia. She is also interested in Arabic and Southeast Asian manuscript cultures. She has been a member of the committee since 2016, when she was completing her MPhil in Islamic Art and Archaeology at Oxford. Click here for her academia.edu page, or follow her on Twitter here.